I am happy to announce that my latest project is online now. I created a social networking site catering specially for Asian foodies. The site is currently under beta testing and few friends are invited to test out the functionality of the site. So far everything seems to be working fine. I got the idea of making this site when I was blogging one day. I thought to myself, wouldn’t it be cool if I were to visit some new places and I can find a fellow foodie who would be eager to introduce me to their local cuisine. I tried using Facebook to look for fellow foodie but most of the people there are only connected to their good friends. Then I thought, why not try a dating site. But then again in dating sites, most of the girls might expect me to be her soul mate and I for one am not looking for romance. In the end I decided, why not make a social networking site that could actually work as a dating site too. The only difference is, people can hook up for one common interest – “Good Food”. If people can find love via Dinemates, good for them. In a way, I think meeting via Dinemates might not have so much pressure as opposed to the conventional dating site. I have no idea how this site will turn out to be but I do have plans line up to make this into an awesome site. Making a site successful definitely is quite a challenge as it will cost a lot of money and time. End of the day, the site just got to be useful and fun for its members. I hope to create more events and members will provide useful contents to its community. Is hard to compete with the more popular social networking sites but I still believe there’s room for a new social networking site like Dinemates that is very niche. 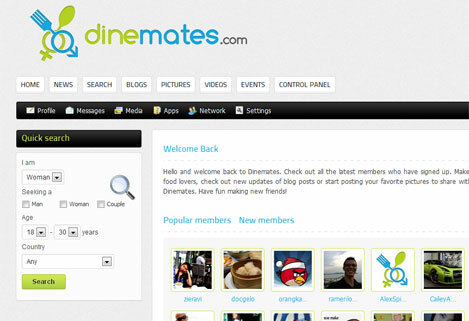 So head on to Dinemates and create a profile to make the site more interesting. Your presence is very much welcome. Oh and did I tell you that the site is 100% Free?